Here’s another review! Hot, Hot Roti for Dada-Ji . Yay! It was available in the Atlanta Fulton library system. A link to the Amazon page is here. Author and Illustrator Blogs: The author is Farhana Zia and Illustrator is Ken Min. My Summary: A heartwarming story of a boy Aneel bonding with his grandfather Dada-Ji over making hot hot roti. As a Pakistani person, it’s really nice to see books with brown characters in it, characters that look like me. 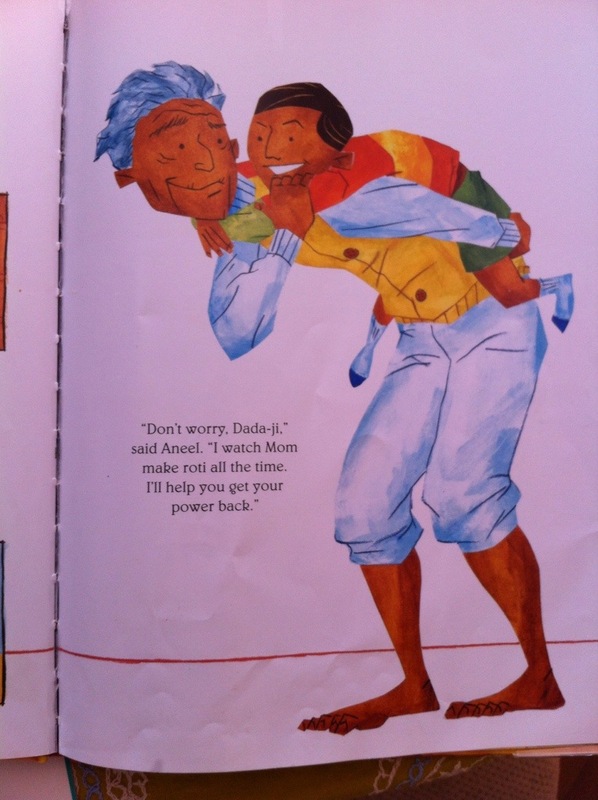 Ken Min’s illustrations are beautiful from their expressions and I especially love Dadi-Ma’s wrinkles!When reading baby A and Z this book, baby A pointed to the grandmother and said “Amma!” meaning her grandmother. She points out other people as Amma too, but maybe the fact that the grandmother was brown helped! Also, I liked how F.Zia wrote a story about roti but made it a family bonding experience. Z has made parathas with her grandmother and it really is a bonding (and sticky!) experience! About the Publisher : Lee and Low specializes in publishing multicultural books and when the #WeNeedDiverseBooks initiative went viral, Lee and Low has been on board with the campaign and is even helping authors of color break in through via their new Lee & Low/Tu Books’ New Voices Awards – an article about this exciting initiative is here. I’ve got my eyes set on another Lee&Low book, King for a Day , about a Pakistani boy who flies kites and got in touch with Lee&Low to request a copy for reviewing as it was not available in my library. They will be sending me a copy for reviewing soon so am looking forward to sharing it with you! Amazon Details: link to Look Inside is here. 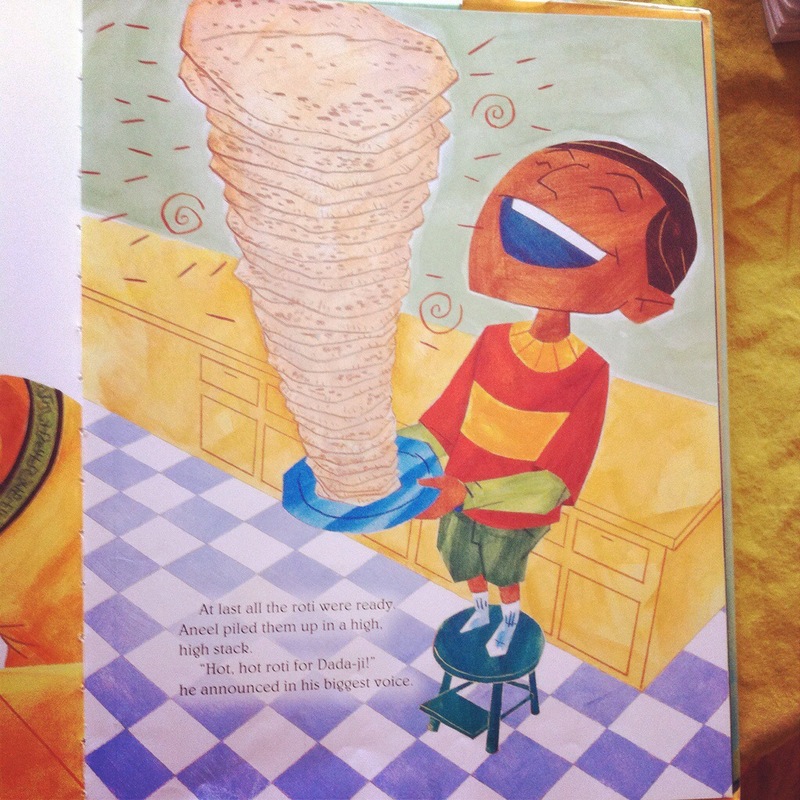 Amazon Summary: Overflowing with family, food, and a tall stack of fun, Hot, Hot Roti for Dada-ji is sure to warm the heart and tickle the tummy. A fun way for children to learn about the cultural traditions and foods of India to be enjoyed by the whole family. So Aneel tugged at the edge of Dadi-Ma’s sari. “No roti today,” she said with her eyes and shooed him away. Hand in hand, Aneel and Dada-ji went outside to find new adventures. First, they made the earth rumble under their feet. 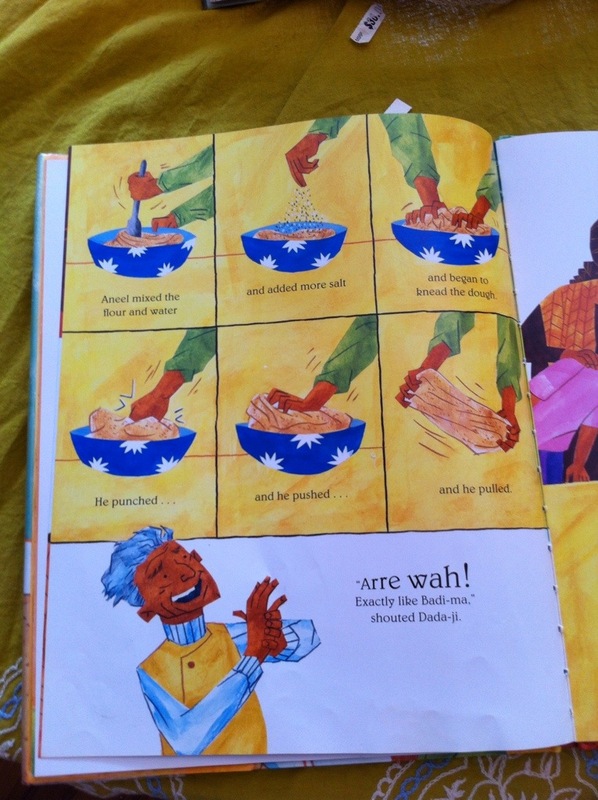 Then they shook a mighty apple tree for Dadi-ma’s pie. Last, they made bare feet touch the blue, blue sky. Author Interview: F. Zia shares how she wrote this story for her grandchildren and is interviewed here and here. Enjoy! My favorite pages below! Next Edina, Kai, and Azra’s Photoshoot!